Failed to connect to the server. Network interrupted or DNS cannot resolve the address. The led indicator doesn’t work. When powering the device up, it is not on. Press the on/off button, it is not on. The circuit may be damaged, please send it back to us for testing. If users make any hardware modifications or re-burn firmware by themselves, which causing the loss of device firmware, we do not provide any sale service, the user must bear all the losses and expenses. Hi, welcome to use S31 US Smart Socket with Energy Monitoring! 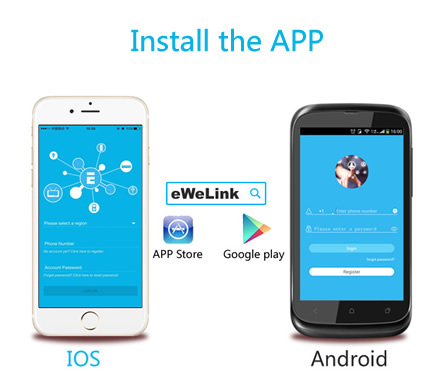 Search “eWeLink” in APP Store for iOS version or Google play for Android version. If you are Android users, we suggest you update to eWeLink 3.1.6 and higher. Plug in and power up your S31 Socket. For Android users, please select the icon accordingly. Click next. For iOS users, please select the corresponding according to the flashing led, click NEXT. 4.2 Now eWeLink only support 2.4G wifi communication protocol, 5G-WiFi-router is not supported. Turn on/off by tapping on device icon. Device state always simultaneous display APP. Enter the device control interface, users can view real-time power, current and voltage of the appliances S31 connect with. Tap Statistics, users can tap START to calculate the how much energy the connected appliance consumes. When they want to stop the measurement, they can tap END to view how much it consumes during the period. Tap the icon the red arrow pointed to view maximum 100-day energy consumption. You can see daily and monthly energy consumption graph and cost. If you want to change the cost unit price, please go to device control interface, go to Device Setting to change it. Tap OPS, you’ll enter overload protection system to set select and set threshold value for real-time minimum power, real-time maximum power, current and voltage. Once your appliance reaches the threshold value you’ve set and selected, your device will be auto-off to protect from overload. Tap Download, your energy consumption history will be downloaded instantly to your phone. Support totally 8 enabled single/repeat/countdown timing tasks each device. Scene allows triggering on/off your devices automatically. Note that only device owner can create scenes. Scenes can’t be shared. Scene Settings is in the upper right corner of Device List. You can set up scenes or smart scenes to trigger on/off the device. 1.1. Green led quickly blinks one time and repeats, which means device failed to connect to the router. The reason may be you have entered wrong WiFi password or your device is too far away from the router, which causes a weak WiFi signal. The device cannot be added to the 5G-wifi-router, only the 2.4G-wifi is OK. At last, make sure that your router is MAC-open. Answers: the S31 doesn’t support to be controlled by LAN. Hi, welcome to use Sonoff T1 EU 1-2 gang WiFi & RF wall touch switch！You can touch the switch on/off, or use App eWeLink/433MHz RF Remote to turn on/off. The switch must be powered up through Lin (Live input) and Nin (neutral input). While L1 out, L2 out are Live output for each gang. 2. Press any of the touch buttons for 7 seconds until it fast blinks to enter into WiFi pairing status. For iOS users, please select the corresponding icon-TOUCH, click NEXT. Answers: the Sonoff T1 doesn’t support to be controlled by LAN. You’ll need to connect it to a WiFi with the Internet. Sonoff model talks to us by blinking its led indicator. By checking how the led indicator blink, we can judge what’s the status of your Sonoff model. Press and hold the pairing button on Sonoff, the led indicator will start to blink steadily. This means the model has entered into pairing status, you can add it to your account. This is AP pairing way for 1st generation Sonoff models, including Sonoff Basic, Sonoff RF, Sonoff Slampher, Sonoff SV, Sonoff S20, old version 1 chnl inching/self-locking smart switch. Press and hold the pairing button on Sonoff, the led indicator will start to blink 3 times and repeat. This means the model has entered into pairing status, you can add it to your account. This TOUCH pairing way for 2nd generation Sonoff models. Except the 1st generation models (Sonoff Basic, Sonoff RF, Sonoff Slampher, Sonoff SV, Sonoff S20, old version 1 chnl inching/self-locking smart switch), all other models belong to the 2nd generation. Please note that some special models may not blink in this way, but you still need to choose TOUCH pairing icon. The special models include: Sonoff Hum, Sonoff LED, Sonoff B1. a. The WiFi strength is weak. Your router is too far away from your Sonoff model, and there may be some interference in the environment. To solve it, please take your Sonoff close to the router. If the problem still exists, please cut off the power of Sonoff, delete the device from your account. Power it up and re-add. b. Make sure you are not using the 5G WiFi. If you are connecting to 5G WiFi, please delete the device and re-add via 2.4G WiFi. Some WiFi Hue/Bridge may not compatible, this is rare. a. The owner has deleted it from the account, it doesn’t belong to any accounts now, but the Sonoff still recognize the previous WiFi. Solution: Please power off the Sonoff and power it up, then wait for a while. If the device is still offline, please delete it and re-add. You can also ping our server address on your computer. Please select the server address according to your location. Then send the result to our support. If you don’t know how to ping, please check this post. The led indicator doesn’t work. When powering the Sonoff up, it is not on. Press the on/off button, it is not on. The circuit may be damaged, please send it back to us for testing. If the users disassemble it and tear down the warranty label, and damage it by themselves, they need to bear their return shipping cost and a certain amount of material costs. If users make any hardware modifications or re-burn firmware by themselves, which causing the loss of device firmware, we do not provide any sale service, the user must bear all the losses and expenses. Baixe e instale o aplicativo, esta manual de instrução é disponível para todos os dispositivos que suportam o Ewelink. Ligue os fios da rede elétrica de acordo com instrução na cobertura exterior. 1.Pressioneo botão do dispositivo por 5-7 segundos até que o led comece a piscar mais rápido ou piscar a cada 2 segundos . 2.Clique no botão“+” para buscar o dispositivo. Para Android, selecione o primeiro ícone , clique em Próxima..
O aplicativo vai buscar o dispositivo automaticamente. 3.Selecione sua rede WiFi e insira a senha da sua rede. 3.1 Seu nome de wifi deve ser letras ou números. 3.2 Se sua rede wifi não houver senha, mantê-lo em branco. 3.3 Agora eWeLink suportam apenas 2.4G wifi protocolo de comunicação, 5G-WiFi-router não é suportado. Dê um nome ao dispositivo e clique no botão “Completar”. Caso o dispositivo esteja “Offline” no eWeLink,aguarde2 segundos.o dispositivo está conectado ao servidor da nuvem através do seu roteador Wi-Fi. Na tela do aplicativo,clique no ícone “on/off “para ligar e desligar o dispositivo e o sincronização de status sempre exibir no aplicativo. O dispositivo suporte até 8 grupos de temporizadores, temporizadores únicas /de repetição / de contagem regressiva para cada dispositivo. Os temporizadores predefinidos ainda podem funcionar em caso de desconexão, mas o dispositivo deve manter a energia ligada. A cena permite que você liga/desliga todos os seus dispositivos automaticamente. Configurações de cena está no canto superior direito da Lista de dispositivos. Você pode configurar cenas ou cenas inteligentes para ligar / desligar o dispositivo. Um dispositivo para um proprietário. Outras pessoas não podem adicionar os dispositivos que já foram adicionados. Se você quiser adicionar seu dispositivo para outra conta, não se esqueça de excluí-lo. O aplicativo consegue identificar automaticamente o idioma do sistema do usuário e sugere a versão de idioma correspondente. Você também pode ir ao centro de usuários do ewelink para alternar o idioma do sistema na ‘Linguagem”. O dispositivo vai auto-lembrá-lo de novo firmware e versão,por isso,não se esqueça de atualiza-lo o mais rápido possível. caso tiver alguma dúvida,pode submeter seus feedbacks no “Comentários” do ewelink. 1.Meu dispositivo já foi adicionado com sucesso, mas porque fica “Offline”? 1ª.O led verde pisca uma vez rapidamente e desliga por 2 segundos , isso significa que o dispositivo não conseguiu se conectar ao seu roteador. A razão pode ser que você tenha inserido uma senha WiFi errada ou seu dispositivo fica muito longe do roteador que poderá causar o sinal wireless fraco.Lembra-se queo dispositivo não pode ser adicionado ao 5G-wifi-router, apenas suporta o 2.4G-wifi. se ainda tiver problema, verfique-se de que o seu roteador não está usando um endereço MAC. 2ªO led verde pisca uma vez e desliga por 1 segundo , isso significa que o dispositivo se conectou ao roteador e ao servidor com sucesso, mas falhou em adicionar à lista de dispositivos .ligue o dispositivo novamente e aguarde um momento,se ainda não estiver funcionando, adicione o dispositivo novamente. 3ªO led verde pisca rapidamente duas vezes e desliga por 2 segundos , isso significa que o dispositivo se conectou ao roteador, mas falhou em se conectar ao servidor. Então confirme se o seu roteador do WiFi funciona normalmente. Por que o aplicativonão consegue encontrar o dispositivo em estado de emparelhamento? Resposta: é por causa do cache do seu celular. Por favor, feche a WLAN do seu telefone e abra-o depois de um minuto. Ao mesmo tempo,é melhor desligar o dispositivo para o tentar novamente. se o dispositivo pode ser controlado remotamente usando na rede 2 G,3G ou 4 G?Posso conectar os dispositivos à LAN? Respostas: os dispositivos elétricos podem ser controlados pelo celular na rede 2G, 3G ou 4G.Para Android,pode conectar os dispositivos à LAN para o controlar remotamente,mas isso precisa de um firmware mais recente para conseguir funcionar.quando o dispositivo não pode se conectar à rede Internet,lembra-se de Manter sua conexão com a sua rede wifi, o dispositivo irá mudar automaticamente à LAN . Atualmente a versão do Apple não suportada. 4. Mesmo que o dispositivo esteja ligado e pressione o botão para ligar, mas o led verde ainda fica desligado e o dispositivo não funciona? Resposta: O circuito deve ficar quebrado, por favor, envie-o para nós confirmar o problema. se o dispositivo for danificado pelo comprador,o comprador deve pagar o frete e os custos de serviço ao reparo. Qualquer dúvidas ou problemas,poderá submeter seus feedbacks no aplicativo do ewelink,e iremos lhe responder o mais rápido possível.